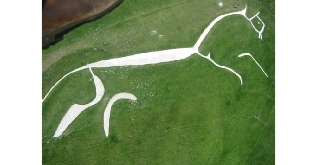 Damage to rich and complex historic environments like that of the Vale of White Horse in Oxfordshire can be mitigated by integration of the Landscape Convention into mainstream planning policy. Our goal is for our research to feed into Historic and Natural Environment planning policy, into Neighbourhood Plans, and into a UNESCO World Heritage Site status bid for the civil Parish of Uffington. A UK Tentative List review was just undertaken recently, in 2012, by the UK Department for Culture Media and Sport (DCMS). Uffington’s bid preparation is planned in time for the next review by 2022. We’ll work with other heritage and environmental stakeholders in the area, for example the National Trust, who maintain the monuments on White Horse Hill in the Parish of Uffington, and North Wessex Downs AONB, which covers part of the parish. Download the July 2014 “Landscape with Prehistoric Hillfigure” Cheriscape conference poster presentation here. A DCMS policy note published in May 2015 included guidance on World Heritage Site bids. In 2008, DCMS prepared a report on World Heritage for the Nation: Identifying, Protecting and Promoting our World Heritage, downloadable here.